Apple has announced that Paul McCartney will be promoting his new album, Kisses on the Bottom, with a live video stream on Thursday, February 9, at 7 p.m. Pacific. The performance, at Capitol Studios in Los Angeles, will be available on iTunes on Mac and PC, as well as by choosing the iTunes Live option from the Internet menu on the second-generation Apple TV. As exciting as that is for fans of Paul McCartney, Apple’s streaming of a live event is more significant when viewed against the backdrop of the current, evolving state of television and film delivery. It could also be a harbinger of things to come. Apple has previously served up streams of its own immensely popular keynote announcements, so this isn’t exactly the company’s first foray into the realm of live video. But with content such as a popular music concert, the company is appealing to a more mainstream audience. And it’s not alone: Plenty of larger media organizations are getting into the streaming video act. Earlier this week, 2.1 million people watched the Super Bowl live online, including on their Apple devices. Being able to reliably serve a huge audience with high quality live streams remains one of the final frontiers in Internet broadcasting. Traditional broadcasting is easy by comparison: A single point of transmission can reach an unlimited number of viewers within range of a TV transmission tower, with a clear view of a satellite, or via the ubiquitous coax and copper lines that connect our homes to cable and telephone providers. By contrast, streaming live events requires extremely complex load-balancing across many servers in multiple geographic locations, not to mention gobs of bandwidth. Many broadcast engineers insist that it’s more difficult and more expensive to stream live video than via traditional means. 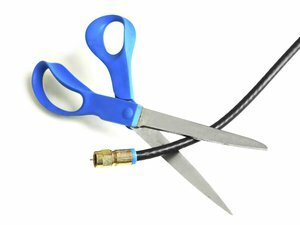 These challenges, and the limitations they place on watching live events, is felt all too keenly by “cord-cutting” consumers who have cancelled their cable or satellite TV subscriptions in favor of purchasing TV shows and movies à la carte in iTunes, using on-demand services like Netflix and Hulu, or some combination of the two. For many, cutting the cord still necessitates the purchase of a traditional antenna in order to watch live broadcasts on major networks and public television. And that’s usually in addition to some sort of set-top box, whether it be an Apple TV, Roku, Xbox 360, or some other device. In this announcement, Apple also potentially drops a subtle but important clue regarding future plans for live broadcasts, and for Apple TV in general: The company’s directions say to select iTunes Live from the Internet menu on Apple TV, but that option doesn't currently appear. Combined with last week’s appearance of Genius features for movies and TV shows on the Apple TV (sans software update), it seems clear that Apple has the ability to dynamically enable or disable functionality on the Apple TV without the need for user intervention. It's possible that Apple will add more “channels” to Apple TV in the future, as needed, or, at the very least, that the company will host more live events in the future. So, whether or not Paul McCartney is your cup of tea, streaming events like this performance—and, in particular, serving that stream to Apple TV owners—are inching us ever closer to the goal of enjoying all of our video content, whether it be recorded or live, using only an Internet connection.